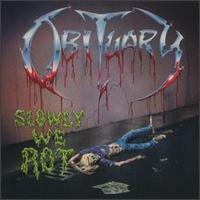 Slowly We Rot is a 1989 album by American death metal band Obituary. It was their debut album and is also the only album on which Obituary used E standard guitar tuning - all of Obituary's other albums use D standard tuning. Despite this, it is widely considered as Obituary's heaviest album. It was re-released in 1997. Slowly We Rot was the only Obituary album featuring Daniel Tucker on bass. His replacement, Frank Watkins, would play on their next seven albums, before he left the band in 2010.